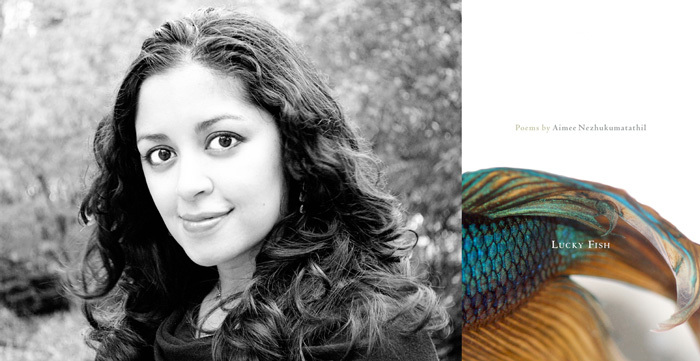 Aimee Nezhukumatathil is the author of three poetry collections: Lucky Fish(2011); At the Drive-In Volcano (2007), winner of the Balcones Prize; and Miracle Fruit (2003), winner of the Tupelo Press Prize, ForeWord Magazine’s Book of the Year Award, the Global Filipino Award and a finalist for The Glasgow Prize and the Asian American Literary Award. She has won a Pushcart, an NEA fellowship and many other accolades and she is a faculty member in the English Department at SUNY-Fredonia. Her most recent book, Lucky Fish, blends the political and personal and is a really exciting and textured collection of poetry. I had a chance to talk to Aimee about her poetry and what influences her writing. A lot of your poetry is deeply connected to the natural world. What is it about nature that you find so poetic? Hmmm…I guess I love to let nature do the talking for me, so to speak. And why not—she has a much richer palette than I could ever conjure up! When I first started writing seriously in college, my subjects weren’t very broad: I basically wrote these sappy love and un-requited love poems. As I learned about the power and loveliness of metaphor (and as I began to get bored with myself! ), I started to draw upon nature as an alternate lens to re-imagine ‘relationshippy’-issues and what it was like growing up Asian American in predominantly white towns. Growing up, my father always took the time to make sure my sister and I knew the names of constellations, tree names, and most types of rock, etc. He did this on what now seems like these luxuriously long nature walks in the desert foothills of central Arizona and in the rich greenery of western NY—basically anywhere we lived, he found ways to make sure we didn’t just stay parked in front of a television. Many of those places have become gentrified and paved over so now in particular, I feel an urgency to witness and celebrate the natural world in my writings. At the end of Twelve Twelve Twelve, you ask, “Just who are these girls?” Do you try to answer questions of identity through your poetry? Definitely not, as I can’t pretend (even in a poem) to have all the answers on such a complicated subject. But in some poems, I hope to at least start a conversation, raise the topic. You’d think that now in 2011 that’d be old hat, but I am constantly surprised when I visit campuses and high schools and students of mixed-race who express their gratitude for trying to tackle that subject in a poem. They are hungry to hear about identity and experience that might reference the culture(s) they grew up with. You used the word “deliquesced” in “Last Summer of Singledom.” What a gorgeous word. What are some of your favorite words? How do you consider language when you write a poem? Oh, I love the sound of words so, so, SO much. Sound very much plays a big part of how I write. I’m always sounding things out as I type or scribble. On my best writing days, I know I must look pretty bizarre if anyone were to encounter me in a coffee shop: Who is that wackadoodle muttering to herself and tapping her pencil on the table while she writes? So, you can imagine–most of my drafting gets done in my office at home. J My fave words would change depending on how high the sun is in the sky, but right now, on this sultry day in July, I’d say: soap. hulabaloo. portmanteau. crepuscular. pantaloons. sabotage. In “Dear Aimee Nehzooukammyatootill,” one of the students says, “Lastly, I was wondering if you ever wrote a poem that really didn’t have a deeper meaning but everyone still tried to give it one anyways?” This is something I have thought about quite a bit over the years, particularly during literature classes when we were intently dissecting a given literary work, searching for deeper meaning, needing to believe there was deeper meaning. Even though I appreciate the importance of literary criticism, I often felt like we were killing all the joy to be had from reading. How would you answer that student’s question? There is real tenderness when you write about your husband and son. Did your writing change when they came into your life? Oh, thank you so, so much! I hope so–I hope it’s evident, the love and joy they’ve brought into my life, if you’ll forgive the corny sweetness. You know, my oldest is only four, so it’s hard for me to step back and make a guess—I’ll leave that up to others—but I’d venture to say so in that I think by necessity and urgency to ‘get it all down, and quick,’ subject matter had to reallllly matter, really matter—for me to steal bits of time here and there away from them in those early months to write. You know, reading so much despair and sadness and hate in this world—a new mama can only take so much before I want to push back against it with writing about little bits of loveliness and ecstatic joy. Not to pretend it doesn’t exist, as I think anyone who reads my books know I’m no Pollyanna in my world-views, but now I guess I feel like if I am going to sequester myself away from giggling little boys who themselves are, right this minute down the hall as I type this, discovering the joys and delights of language in their books as my eldest sounds out unfamiliar words to his younger brother, who looks lovingly up at him with so much wonder—then by golly, I’m going to try to BRING IT when I sit down to the page. And for me, in this stage of my life, that ‘it’ is love. That ‘it’ is joy. How autobiographical is your poetry? Very. No apologies. But always with a twist, almost like I’m using the persona of ‘Aimee Nezhukumatathil.’ When I think about it, all of the people closest to me in my life call me by some nickname. My parents and husband only ever actually call me Aimee when I’m in trouble or I’ve upset them. So to hear my actual name actually startles me in a way. My students call me “Professor Nez,” and to my friends, I’m anything from Aim, Aimez, Maimee, Aimeenez, Aim-ola, Aims, and dozens more. And of course, to my little boys—I’m simply Mommy or Mama (my favorite name of them all). Side note: If you want a no-fail way to send my eldest son into a giggle fit, tell him my actual name (my sons share their father’s last name)—he thinks it’s the funniest, most magical sound in the world—like he almost doesn’t believe it. But back to your original question—I’ve mixed events and people for the sake of dramatic tension in a poem, etc. I really do love to play with the element of persona, but really, the ‘mask’ of writing that way mainly helps me in thedrafting phase especially if I’m dealing with particularly emotional/personal subject matter. Why is Lucky Fish divided into three sections and what was your thinking in terms of the naming of each section–A Globe is Just an Asterisk, Sweet Tooth, and Lucky Penny? Those were titles of poems in three different piles that I felt could be grouped together because of their similar and resonant subject matter. I think of those section names like those often hand-painted, charming signs on the highway that say “Welcome to…!” A Globe…deals with my travels around the world and this country; Sweet Tooth contains poems where there was an element of play either in subject matter or in the poem form itself (while playing around with white space too), and Lucky Penny is the section that introduces my two pregnancies, my first steps into motherhood, and what it means to witness (to) the world from this new vantage point. Lucky Fish is your third book. What have you learned about assembling a collection of poetry? How do you assemble a body of work for publication? Outside of the actual writing of poems, it’s the most difficult but most rewarding part of the book process. It’s fun to step back a bit from the composing and take inventory. For me, there are no hard and fast guidelines, and I went about manicuring the manuscript in a completely different way each time. The only similarity between the three books is that I never set out to write a “book.” That is, I’ve never written consciously with a project or theme in mind. Liz Rosenberg describes assembling a manuscript as trying to go on a “journey without a map,” and I agree, but just like going on a road trip with no map—it can be a grand time, filled with surprise and fun stops along the way, or one giant hot mess and you’re left needing to use the bathroom with no rest stop for miles! When I get to about 25, 50, then about 90-100 pages of poems, I pause and gather them into a binder and make notes in the margins. Then I don’t look at it again for another 25 or so poems. Right now, I’m at the 70-something page mark but I’d wager only a third of those will eventually make it in another collection. I’d love to try a ‘themed’ manuscript one day, but it seems really difficult right now. I just haven’t found a subject I could maintain for 60 poems’ worth, but I’m in awe of those that do. When I was a kid, I often told my parents I was changing my last name as soon as I married. I was teased quite regularly, as you might imagine, with a last name like Gay. At this point in my life, I am quite certain I will be keeping my name, at least professionally, when I marry. I’ve grown to love my last name. It is a strong name. Also, it’s only three letters long, which helps with my laziness. I thought about how my outlook has changed when I read “Dear Betty Brown,” where you write about how you didn’t change your last name for your husband and how your name was given to you by your parents. Names are so important so when someone like Betty Brown asks Asian Americans to adopt names that would be easier for Americans to pronounce, she’s actually asking Asian Americans to erase part of their identity. What’s even more infuriating, I’d guess, is that she made her crazy statements in 2009, not 1959. It’s staggering, when you think about it. Have you dealt with other experiences where you have been asked to erase part of your identity because of your last name or some other indelible part of who you are? One of my dear friends is the poet Ross Gay (do you know his work? If not, do look him up!) and like his name, I do so love yours—so zippy and packs a punch—so I am secretly hoping, even though we’ve never met in person (I’ve been a fan of all the writing I’ve seen of yours) that YOU don’t change your name either. J But oh yes, growing up in mostly white neighborhoods, I felt very pressured to assimilate and be vanilla and others did too—though I honestly believe the people who did this thought they were helping me/my family ‘fit in’ and did so with the best of intentions. Starting with the OB/GYN in Chicago who delivered me—telling my parents to only teach me to speak English (and not their beautiful languages of Tagalog and Malayalam) so I wouldn’t have a funny accent and be made fun of in school—to boyfriends who straight out told me they expected me to drop my last name if we got married so it wouldn’t look “weird.” Side note: the guy who I ended up marrying scored major points by telling me early on that he would be devastated if I lost my beautiful last name and took his. Swoon! When we talk about diversity in writing, the discourse generally focuses on the underrepresentation of African Americans, and, on a good day, the conversation might also extend to Latinos. There are, however, all kinds of underrepresented writers including Asians and South Asians, queer writers, differently abled writers. As an Asian American writer do you ever feel left out of the conversation about diversity? I do, but I don’t—that is to say that I can’t let myself think I’m not being represented or it will take away from time and energy I need to write poems in the first place. I am blessed and grateful to call many Asian American activist/writers friends, but I’m better and more comfortable letting my poems speak for themselves. Much of that is my personality, I know. Places like AWP and the National Endowment for the Arts have been good to me. I’m a tenured professor and I got hired when I was twenty-six with a chapbook and just a handful of publications to my name. But the fact that many of my writer friends could hardly remember the last time an Indian (or Filipina) poet won an NEA makes me all kinds of sad. However, I also believe that this is a very hopeful and exciting time to be an Asian American writer. The sheer range and talent and numbers of Asian American poets and community-building organizations like Kundiman make me think a (good) change is just on the horizon. I’m heartened to see so many editors and reading series coordinators going out of their way to be more inclusive. More diverse writers will get teaching jobs, win major prizes, get asked to read poems on more campuses. We’ve got a long way to go, but we’re getting there. We’re getting there. You teach environmental literature. What is environmental literature? There are so many perspectives on this, but in a (large-ish) nutshell, I tend to look at it as: poems, stories, and essays (and all the gorgeously weird hybrid writing that blurs those three genres too!) that contain situations and perspectives of various ecological issues with an eye towards charged writing that inspires people to take action, make a change in how they treat this planet. I read in an interview that a lot of your poetry is research based. How so? Anything I could come up with here would so sound utterly cheese-tastic and I’d best leave that for others to decide, so I’m slightly amending the question to What do you love most about writing: and that is simple—I love that moment of writing when I surprise myself, either through a particularly juicy metaphor or memory, and the very real sense of getting to relive a moment yet another time, with new wisdom and experience collected and spun in a new way, so it almost becomes a second or third life lived. What’s extra crazy is when someone comes up after one of my readings and says, I felt the same way too. That moment of connecting my world to a stranger’s world through poems—I just feel very, very lucky and blessed to do what I do.